A-HOTEL.com - Luxury and cheap accommodation in Brighton & Hove, United Kingdom. Prices and hotel, apartment booking in Brighton & Hove and surrounding. This indicative offer was derived from the most recently booked accommodation in Brighton & Hove and sort by the price, from cheapest Brighton & Hove accommodation to the most expensive hotels. To select accommodation by your preferences we recommend to choose from 436 accommodation offers in Brighton & Hove in total. By entering the dates of your overnight stay in Brighton & Hove and using the filter tools you can sort the best possible accommodation for you. The entered dates of your stay are crucial for the most accurate offer as it derives all the online information on pricing and availability of Brighton & Hove accommodation. Then you can book the selected Brighton & Hove lodging (hotels, apartments etc.) immediately. Situated in the heart of Brighton's historic Lanes, Brighton Square Apartments offers serviced apartment accommodation. The location has over 1000 shops in the immediate area and it is also the centre for dining out in Brighton. Featuring a terrace, Bird Sisters Cottage is in a prime location in Brighton City Centre district of Brighton & Hove, 1 km from Churchill Square Shopping Centre and 1.3 km from Komedia. With its sumptuous Renaissance style, The Grand Brighton has a magnificent location on Brighton’s seafront and is just a 10-minute walk from Brighton Pier. The rooms at The Grand Brighton have high-quality furnishings, including Egyptian cotton bed linen and bathrobes. On the seafront in the heart of Brighton's 'Lanes', this friendly hotel is well-located for nightlife, shopping, restaurants and the beach. The Queens Hotel and Spa has spacious, modern rooms with flat-screen Freeview TVs, toiletries, hairdryers, tea and coffee making facilities and free WiFi. 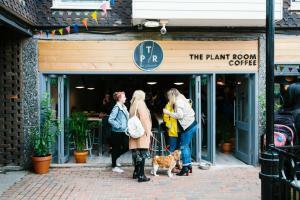 Situated in Brighton & Hove, just 800 metres from Brighton Dome, Tyson Place provides accommodation with free WiFi. The property features sea and city views, plus is 1 km from Brighton Pier. Situated on a tree-lined avenue, Langfords Hotel is just a few metres from the shingle beach of Brighton & Hove's historical seafront. The shops and restaurants of Brighton’s city centre can be reached in a 15-minute walk. Overlooking the seafront, Jurys Inn Brighton Waterfront benefits from its own entrance at the front of the hotel in the right corner and is just 400 metres from the Brighton Pier and the Royal Pavilion. It offers free WiFi throughout, a restaurant with sea views, a pool and a spa. The Charm Brighton Boutique Hotel & Spa is a luxury grade II, boutique hotel offering bright rooms with free WiFi and a great central location, just a minutes’ walk from the beach. Each room in the elegantly refurbished historic building has a flat-screen TV and a private bathroom. Portland Street is located in Brighton & Hove. It has free bikes, a garden, garden views and free WiFi. Located 1 km from Brighton Dome in Brighton & Hove, Trafalgar House Apartment One offers accommodation with a kitchen. The Komedia is within 1. Green Diamond by Creatick Apartments in Brighton & Hove provides accommodation with free WiFi, 400 metres from Brighton Pier, 500 metres from Brighton Beach and 700 metres from Victoria Gardens. The property has city views and is 700 metres from The Royal Pavilion. Hilton Brighton Metropole looks out over Brighton seafront and is close to the shops and city centre. The grand Victorian building has large rooms, two restaurants, a spa and a fitness centre with an indoor pool. The New Madeira is centrally located on the Brighton seafront, opposite the Brighton Pier. There is free Wi-Fi in all areas. With a city centre location on Brighton’s Western Road, the adult-only Britannia Study Hotel offers contemporary en suite rooms with free WiFi, and is situated within minutes of numerous shops and restaurants. Each room has a TV, a safe, mini-fridge, a work desk and wardrobe. Malmaison Brighton looks out over Brighton Marina to the sea. It has free parking, a bar, a restaurant, modern rooms with monsoon showers and outdoor terraces looking out over the water. Situated only 1.1 km from Brighton Dome, Large property with roof terrace is a 5-star property well set in the Brighton City Centre of Brighton & Hove. The Imperial Hotel is within a 3-minute walk from the promenade, Hove Lawns and the beach. The hotel is set in a Regency period building with high ceilings, a terrace, a spacious bar, a breakfast room and a lounge. Beside the Seaside Apartment - sleeps 1 to 3 guests - fast wifi is situated in Brighton & Hove, less than 1 km from Brighton Pier, a 10-minute walk from Brighton Beach, and 1 km from Brighton Dome. The apartment, set in a building dating from 19th century, is 1. The Lanes Residence offers accommodation in Brighton & Hove. Set above the historic Lanes, this apartment boasts views over Brighton Square and is 100 metres from The Royal Pavilion.